Cliven Bundy's sisters, Lillie Spencer and Margaret Houston walk with Bundy's sons Ammon and Ryan to file criminal complaints against the Bureau of Land Management at the Las Vegas Metropolitan Police Department, May 2, 2014. Ammon and Ryan Bundy, leaders of the gun-toting protesters who have occupied a federal wildlife refuge in Oregon, learned defiance against the U.S. government from their dad, Cliven. Like their father, a Nevada rancher who became infamous in 2014 when he staged an armed standoff with the federal Bureau of Land Management, the Bundy brothers believe Washington is bent on gobbling up their land and that of other ranchers. “Once they can use these lands as free men, then we will have accomplished what we came to accomplish,” he said. The “they” in this case are Dwight Hammond and his son, Steven, who are facing jail for setting arson fires that spread to government lands — and who say they didn’t ask for the Bundy clan’s help. Ammon Bundy, 40, insisted they were acting with the blessing of other angry ranchers in Burns, Oregon, who believe the Hammonds are being railroaded by the feds. “We’ve been able to see that these ranchers have been in this situation that’s really a form of tyranny,” he said. And in statement posted Saturday on his website, 69-year-old Cliven Bundy said the Hammonds were being punished unfairly. A Mormon and a father of 14, Cliven Bundy galloped to national fame two years ago when he — with the help of several dozen armed supporters — chased off some federal rangers. The rangers had been acting on a court order when they tried to confiscate 500 of Bundy’s cattle for illegally grazing his herd on public land since 1993. While Nevada Sen. Harry Reid, a Democrat, called the Bundy family patriarch a “domestic terrorist,” the state’s Republican senator Dean Heller called him a “patriot.” Cliven Bundy became a right-wing darling thanks, in part, to frequent coverage of the land drama by FOX News. 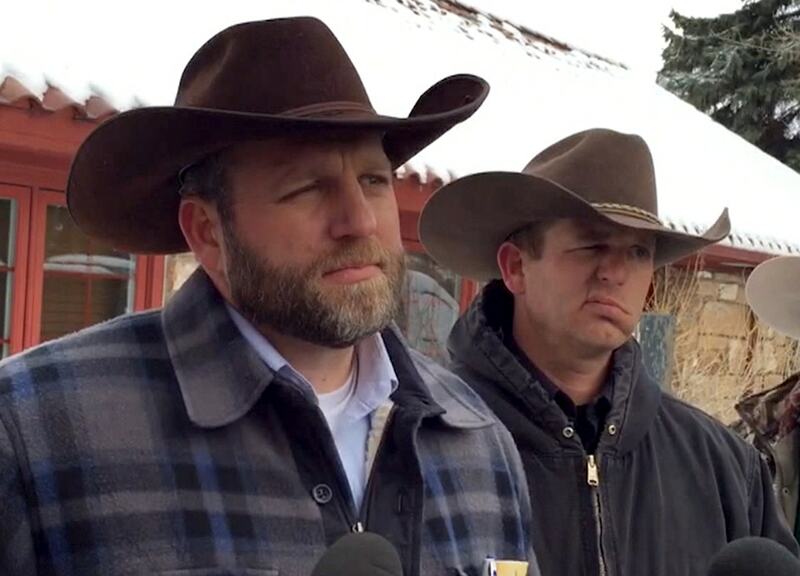 Meanwhile, Cliven Bundy’s sons rallied behind their dad. But the Republicans who embraced Cliven Bundy — like GOP presidential candidates Rand Paul and Ted Cruz — backed away after he was quoted in a New York Times article making racist remarks about African-Americans. Neither Bundy son lives on the ranch in Bunkerville, some 80 miles northeast of Las Vegas, which has been in the family since the 1870s. Ammon Bundy lives in a Phoenix, Arizona, suburb and runs a valet car fleet service, according to public records. Like his dad, he is a registered Republican and has a hunting license. He has also contributed to Infowars web site run by conspiracy theorist Alex Jones. Ryan Bundy is a former Republican who is currently not affiliated with any political party, according to records. He lives in Cedar City, Utah, and owns a construction company. He has reportedly took part in protests against the BLM’s decision to bar all-terrain vehicles from Utah’s environmentally sensitive Recapture Canyon.